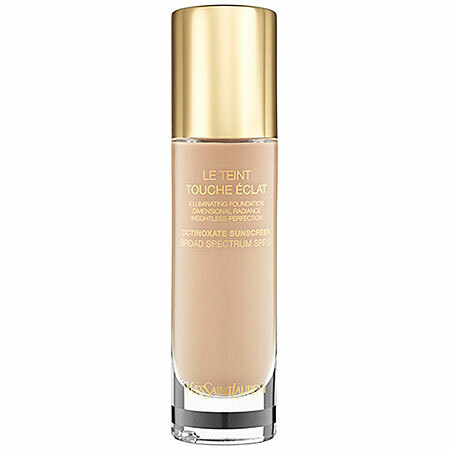 The YSL Le Teint Touche Eclat Illuminating foundation is the newest foundation out by YSL. These descriptions always make the product sound like a miracle worker don't they? YSL previously released the widely popular concealer, the Touche Eclat Radiant Touch. So it looks like they are capitalizing on that popularity by making a foundation with similar illuminating capabilities. This is, no doubt, a very nice product. The formula feels light on the skin and leaves a glowy, dewey effect. It provides medium coverage and has a really subtle, but pleasant smell. This foundation also leaves the skin looking natural, not cakey or "foundationy." Although this foundation has an illuminating effect, its not at all shimmery, like other foundations. This makes it useful for covering blemishes as well as just evening out skin tone. Very shimmery foundations (like Almay Wake Up) tend to highlight, rather than conceal blemishes, but this foundation covers very nicely. Another great thing about this foundation is the range of colors. It has a bunch of color options with both rose and golden undertones. I was actually suprised that I wasn't matched with one of the colors with Rose undertones as those usually work the best with my skin. However, the color I ended up with matches my skin perfectly. I wore this foundation for a day at work. It takes A LOT for a foundation to stand up to my days mainly because I am in a school and the temperatures seem to vary from room to room. One minute I'm freezing, the next im sweating. So no matter what I do my skin seems to look pretty shiny by the end of the day. Because this foundation has that subtle light reflection and dewiness, the shininess was very appararent by the end of the day. For work, I definitely go for matte or semi-matte finish foundations because they need to control oil throughout the day. I wouldn't choose this foundation for all day wear, at least not yet. As winter comes on and temps drop my skin tends to get a lot more dry so it may work a lot better then. This foundation would, however, work great for just a couple hours of wear or for people who have very dry skin. You can also improve the length of wear by using an oil controlling primer. I had an allergic reaction to the last primer I tried so, needless to say, I'm taking a break from those for a bit. This foundation is pricey, at $55 a bottle, but that's to be expected from Yves Saint Laurent. I would recommend grabbing a sample of this from your local Sephora before committing to buying it. I hope this was helpful for you guys and if you'd like to see it applied check out the video! !